My sister once described kombucha to her husband as "vinegar soda," which, you're either here for or hard pass (my brother-in-law being in that second category). I came to my current (high) levels of consumption after my attempt at the Whole30 last year. I found kombucha to be a good substitute for alcohol, with its carbonation and tart flavor. Put it in a wine glass at the end of the day, apply some suspension of disbelief, and you're all set. During that time, I started my habit of filling growlers from Urban Farm Fermentory, where they make different flavors of kombucha, infused with seasonal fruit, herbs, and foraged products. I love going and seeing the different flavors available and trying new flavors and blends. I still make sure to have a growler (OK, two) of the stuff in the fridge, even if none of the other Whole30 habits stuck. 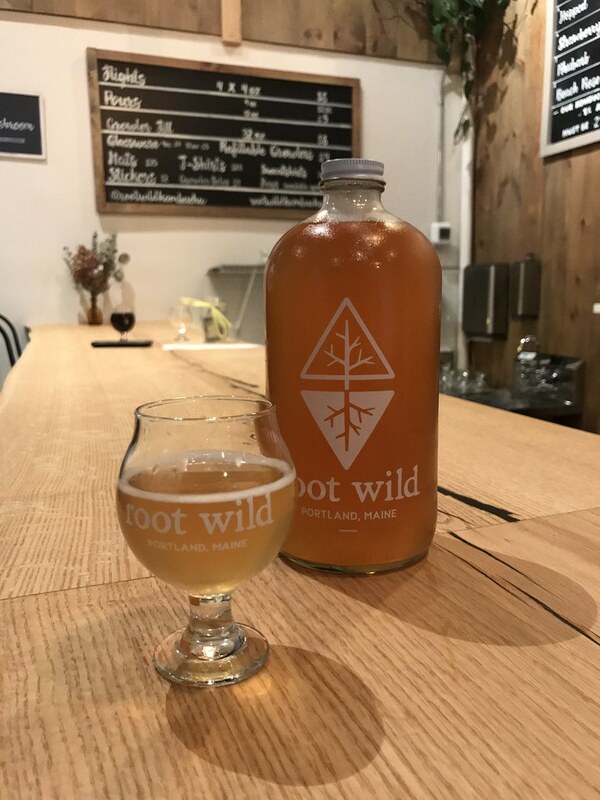 Enter Root Wild Kombucha, a new kombucha brewery on Washington Ave. in Portland. The brewery's tasting room and production facility opened in the former home of the Sahara Club, ironically where AA used to meet. Root Wild is run by Reid Emmerich, who helped to start the Urban Farm Fermentory with Eli Cayer. So there are definitely similarities between the two facilities, and comparison is unavoidable. The other owners, Tom Madden and John Paul, run Lone Pine Brewing, so you know the beers are going to be good too. Root Wild has three flagship kombucha flavors: lemon cayenne ginger, blueberry lemon thyme echinacea, and vanilla rooibos white oak. The seasonal flavors on the day I was in were purple shiso, hopped, strawberry, rhubarb, and beach rose. There were also three beers: a maté IPA, orange juniper DIPA, and a stout with chaga and toasted oak. My friend G. and I tried several 2 oz. samples of the different flavors, and I was really pleased by them all. The hopped tasted a bit more beer-like than UFF's version does, and the fruit flavors are bright and pleasantly balanced. I was impressed by how thoroughly the added flavors came through. Just like at UFF, you can fill growlers, so I happily took home a strawberry fill. Root Wild has just started canning its lemon, blueberry, and vanilla rooibos flavors in 12 oz. cans. The tasting room is a pleasant space, sure to become homier with time. 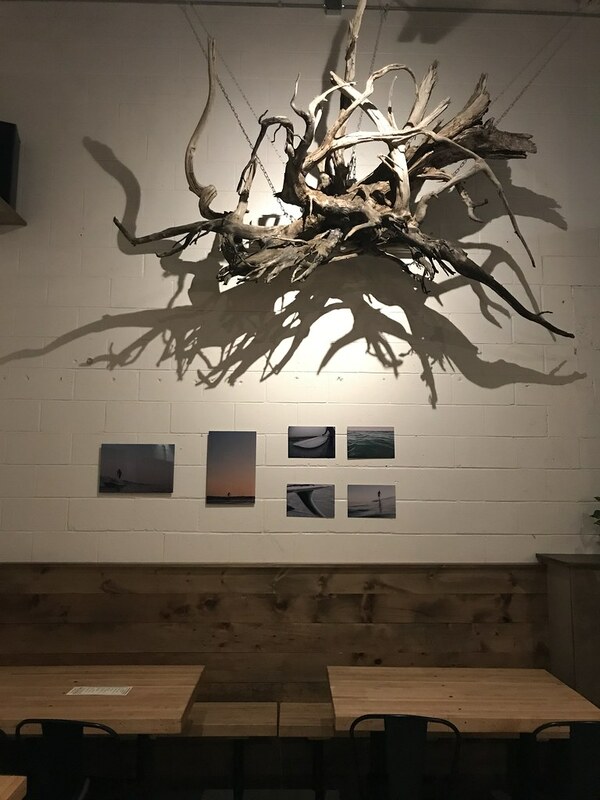 It has a beachy, surfer vibe, so perhaps that is more your style than the foraging hippie vibe down at UFF. Personally, I'm happy to have two local options to satisfy my kombucha habit. The more the merrier! I've been stalling on writing this post. It has nothing to do with the lovely, newly opened Forage Market in Portland, but more because I'm not ready to wade into the bagel fray. I'm not trying to publicly declare who makes the Best Bagel in Portland. Or Why Your Favorite Bagel is Inferior. You see, there are now as many bagel places in the Greater Portland area as there are opinions about bagels. 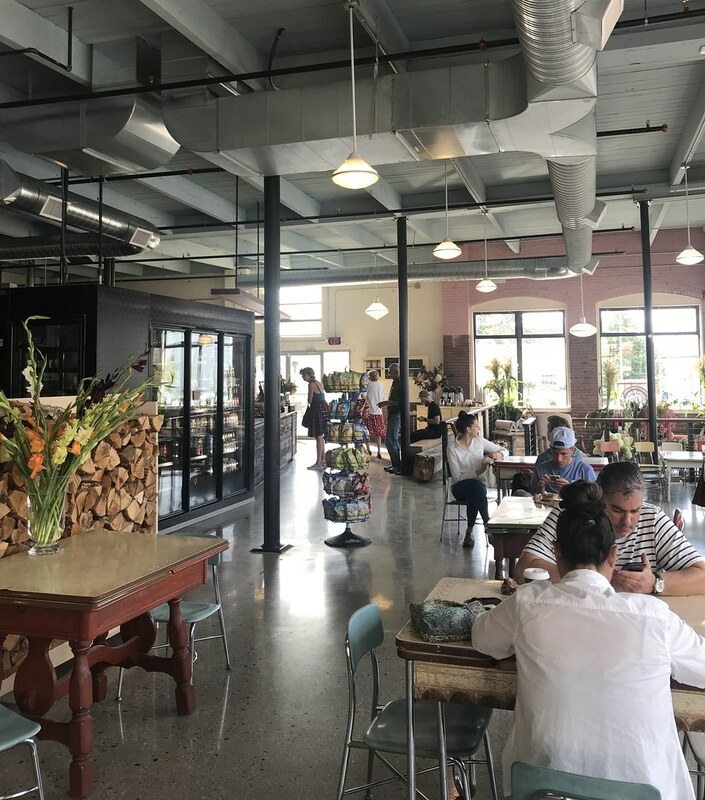 There's *takes a deep breath* Mr. Bagel, Scratch Baking Co., 158 Pickett Street, Union Bagel, The Purple House, Rover Bagel, Rose Foods, and now Forage Market. Prof. A. of Portland Food Map called 2017 the Year of the Bagel, and the bagel madness continues into 2018. I love most bagels in the Portland area. 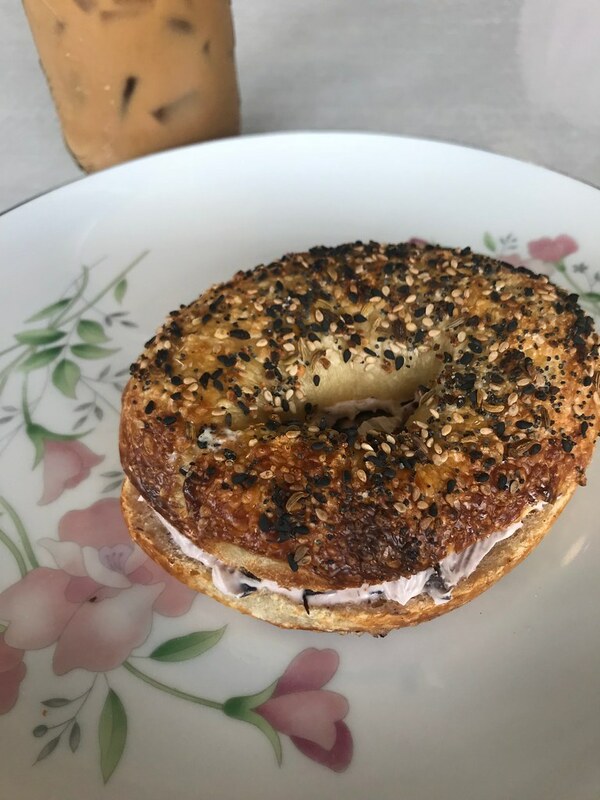 I have always loved bagels—I grew up eating frozen Lenders onion bagels in the suburbs, so you can form your own opinion about my authority on the subject. Lately I have very few qualms about eating a Scratch salt bagel smeared high with herb cream cheese for breakfast several times a week. While some are certainly better than others, I've yet to meet a bagel I didn't enjoy. Forage bills itself as a market, but really it's a bagel place. Broadturn Farm shares a small corner of the new space on Washington Ave. in Portland, so you can buy some fresh flowers with your bagel. But Forage's menu is largely bagels. Some lunchtime sandwiches are available on baguettes. But we're here for the bagels. The space is large and industrial, with high ceilings and large windows. 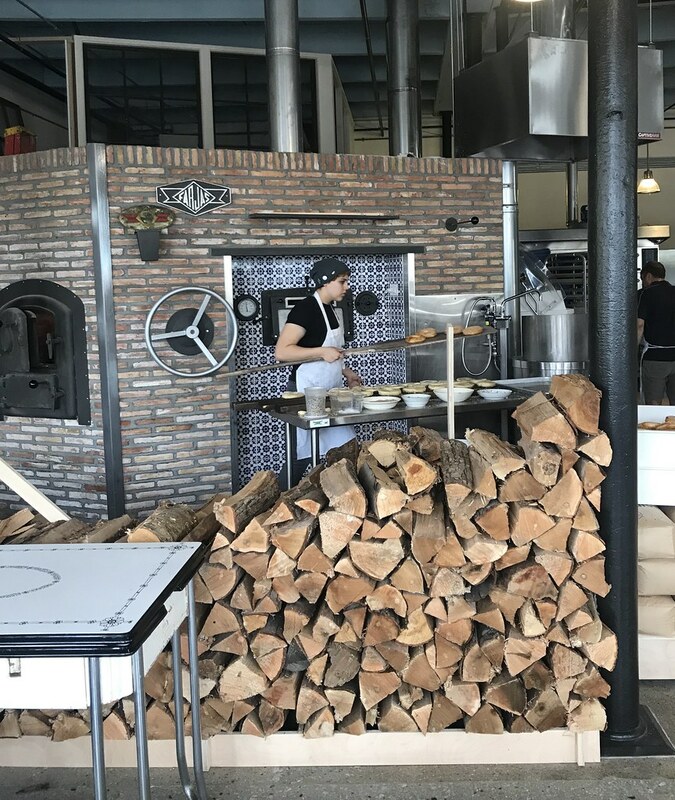 A wood-fired oven faces the seating area, so you can watch bagels being fired while you enjoy your meal. This would be a large place to spend a morning working, although I don't know about the existence of Wifi or not. The bagel itself is crunchy, thin, and airy, with big holes in the baked dough, in the Montreal style of bagels. But really the minute I saw the black olive cream cheese, I was won over. Forage Market's bagels moved to the top of my personal leaderboard of bagels. Did I just say they're the best bagels in Portland? You'll have to stop in and see for yourself. 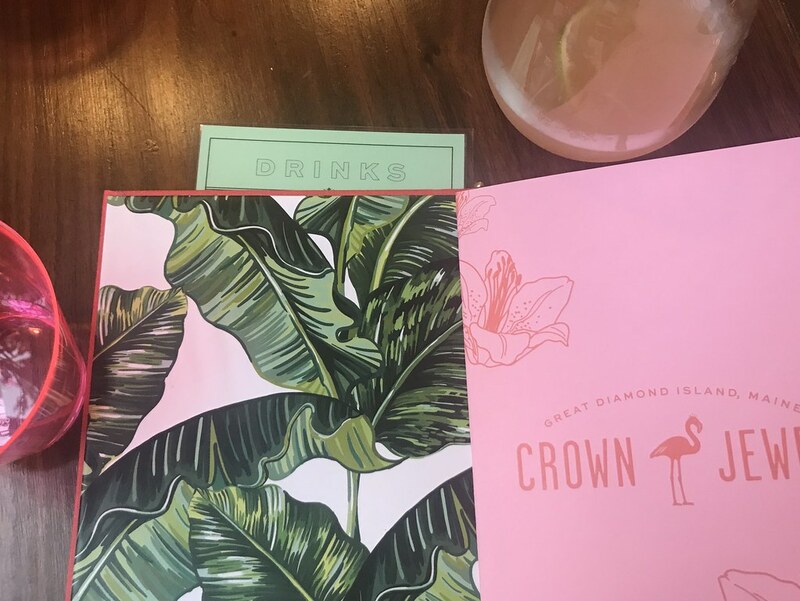 There's a new dining experience on Casco Bay's islands: Crown Jewel on Great Diamond Island. Our visit two weeks ago was a great, casual island experience with some fantastic food. 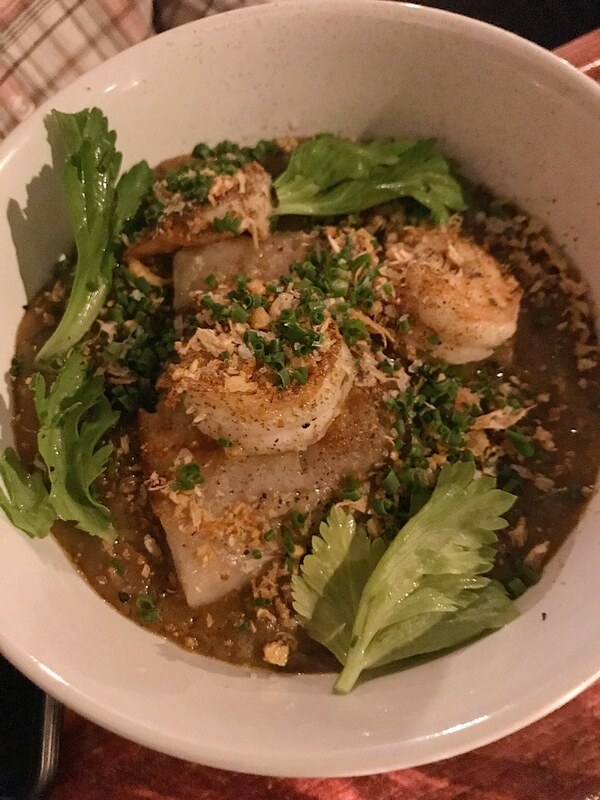 I love escaping to the islands, and Crown Jewel adds an exciting facet to Portland's already dynamic food scene. 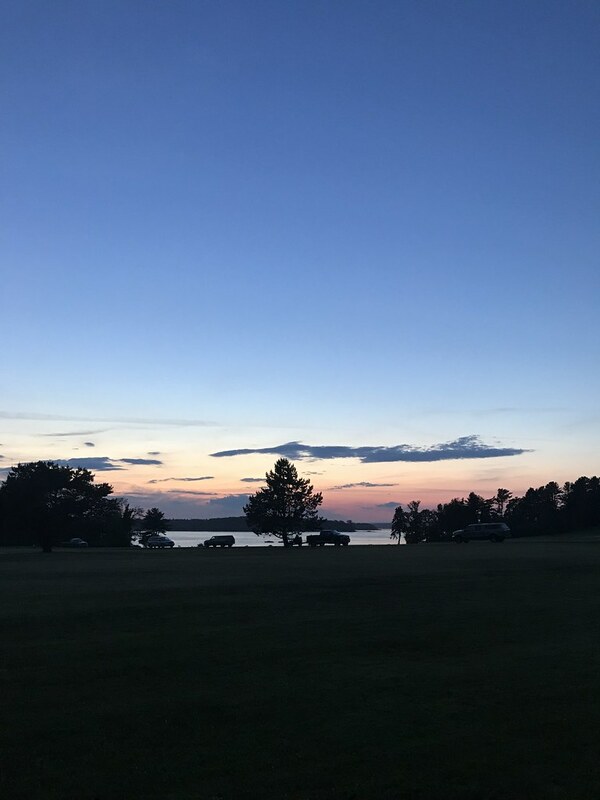 I paid my first visit to Crown Jewel with my aunt, uncle, and husband on a beautiful night—under a sunny sky filled with clouds that created a beautiful sunset on our way back. We took the early-ish ferry (at 4:15pm), which gave us plenty of time to enjoy dinner without getting back too late. We walked around Diamond Cove a bit and saw the former military barracks turned summer residences. Crown Jewel is in a space that was formerly a small general store and has been rennovated to be a hip restaurant space, still with a little market in the back. 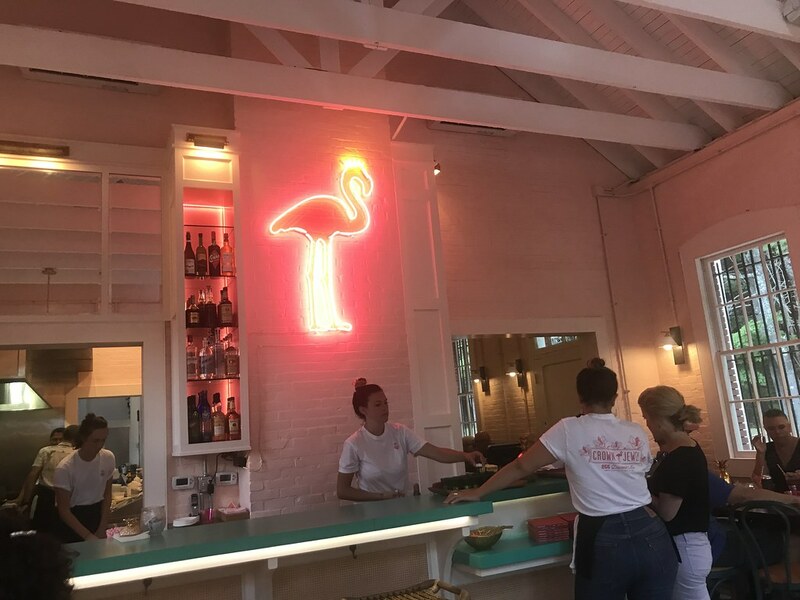 I love the on-trend decor: lots of brass, palm leaves, rattan, and neon pink flamingos. I'm sure it will look dated soon, but hey, we're here for a good time, not a long time, right? We started our meal off with Hemingway daiquiris ($12), a rum daiquiri with a bit of grapefruit juice. I was also tempted by the strawberry mezcal smash ($12) and the Crown Jewel rum punch ($13). My friend A., the owner of East End Cupcakes, is the manager at Crown Jewel and I was so thrilled to have her whipping up these delicious drinks for us. After our round of cocktails, we ordered a bottle of the Lambrusco ($36), a chilled, slightly sparkling red, to enjoy with our meal. The menu, like most these days, has a large selection of starters/small plates and salads and only a few entrees. There wasn't much on the menu I didn't want to order, and we knocked out a fair amount during this meal (I'll hit the rest on my next visit!). 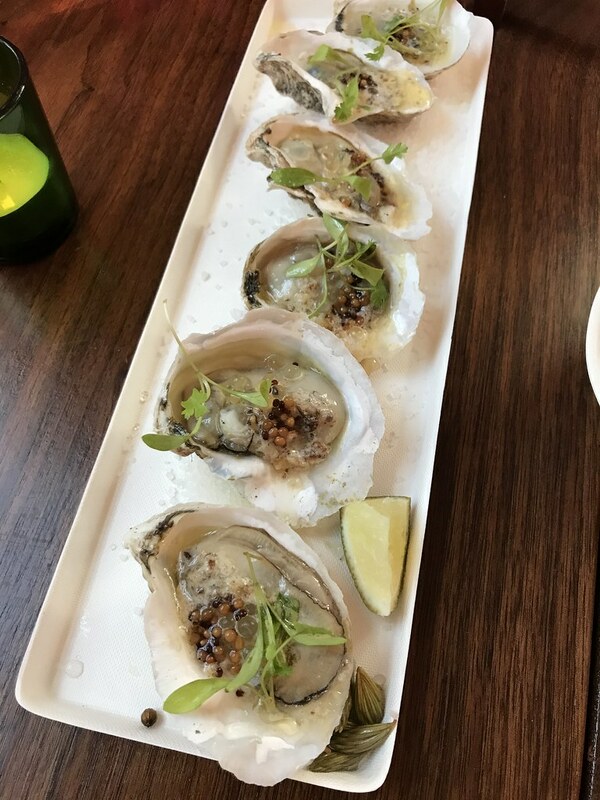 We started with a half dozen of both raw ($18) and grilled ($19) oysters—the grilled ones topped with butter, yuzu pearls, and pickled mustard seeds. The oysters were lightly grilled and the toppings unobtrusive, so the oyster flavor still took center stage. 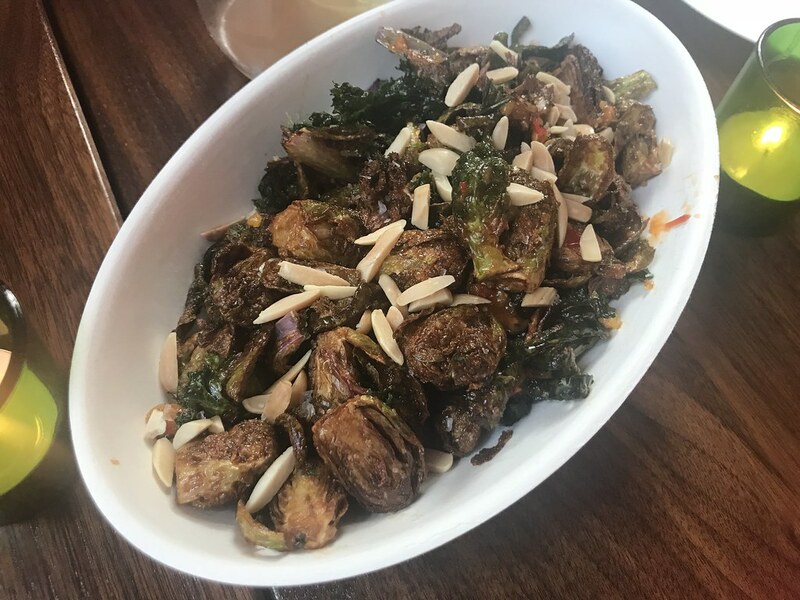 Next up was the Fried Green Things ($8) a heaping bowl of fried Brussels sprouts, kale, and maybe also zucchini? The selection of vegetables may change, but it's always served with apricot harissa and slivered almonds. I've yet to meet fried Brussels sprouts I didn't enjoy. 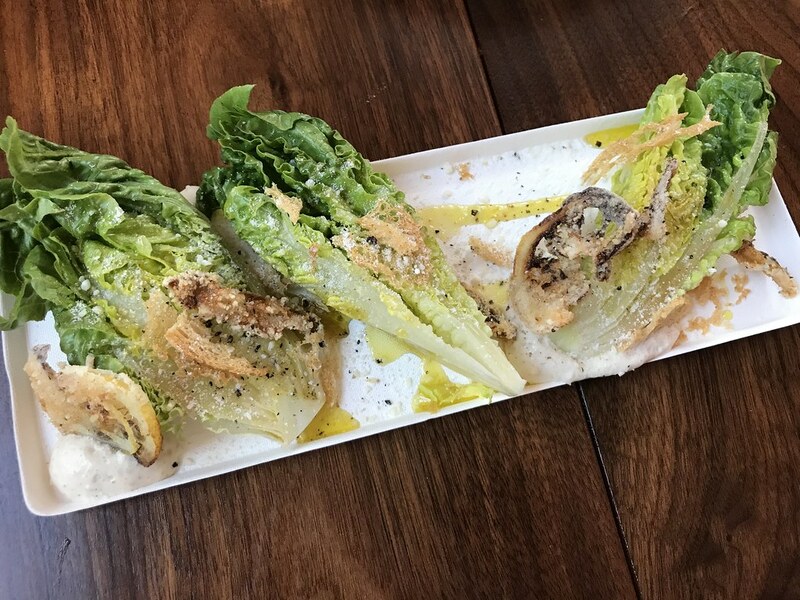 The summer lettuces salad ($12) might have been my favorite—a take on a Caesar, with fried white anchovies, fried lemon wheels, and crispy pieces of fried Parm. With a lemon-y dressing and lots of black pepper, this salad had tons of flavor. 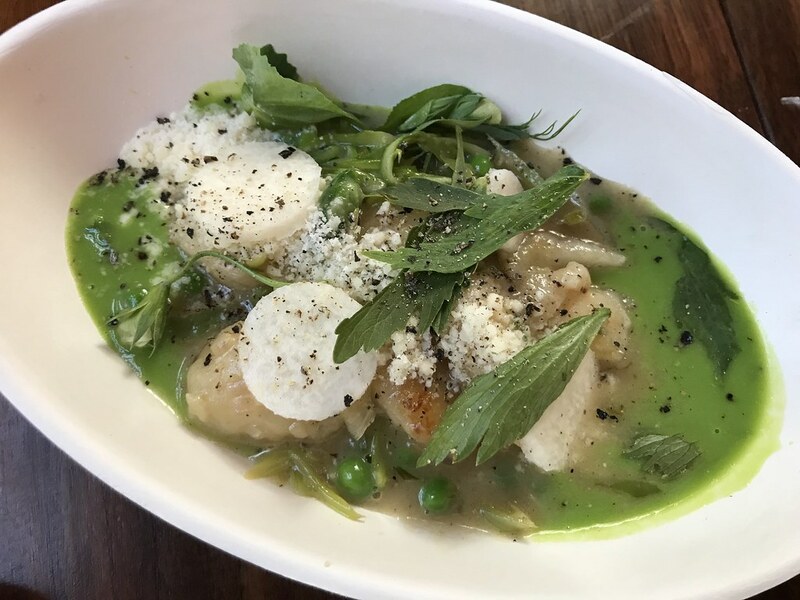 After salads, we each had a larger plate—I went with the gnocchi verde ($18). I am generally suspicious of gnocchi in restaurants (so much of it is bad), but I trusted the chef at Crown Jewel to make delicious ones. 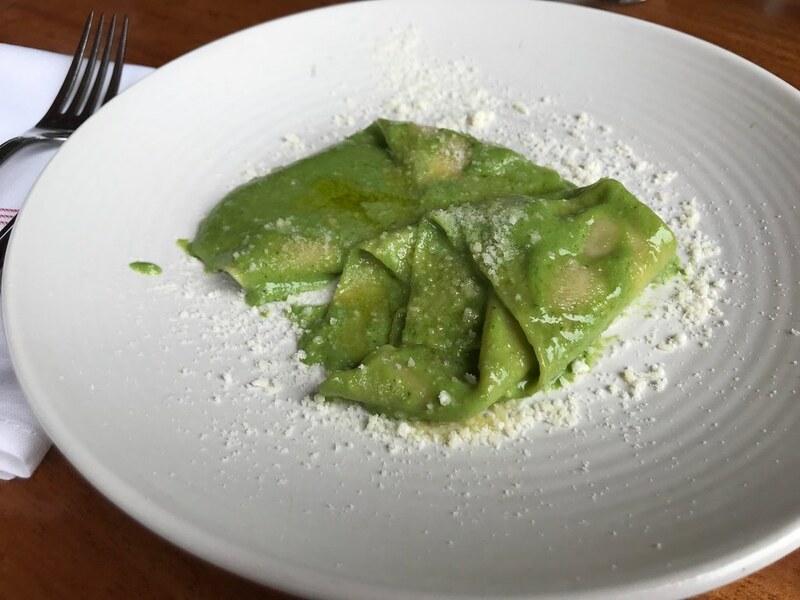 The soft, potato dumplings were covered in a pea puree, with asparagus, jicama, and Pecorino. A decidedly spring-y dish, but the perfect balance of comforting and light, even enjoyed in late August. 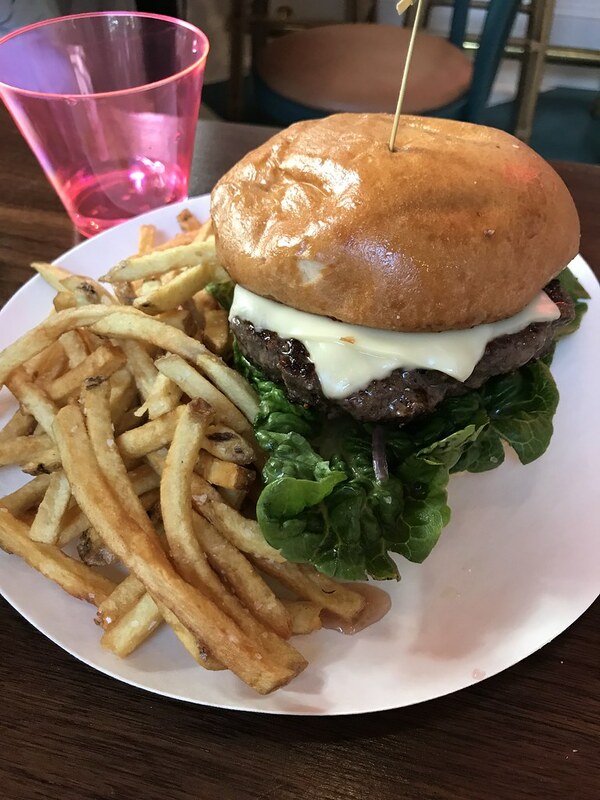 A. had a fantastic hamburger ($14) with a soft Brioche bun and an impeccably flavored burger patty. We opted to skip an earlier ferry back to the mainland, giving us an additional hour to enjoy dessert and another slow walk back to the ferry. We were all pretty full by this point, but Alysia insisted we had to try the brown bread ($10), so we happily acquiesced. And it was incredible—warm and gooey, with crispy, bruleed edges. I knew Crown Jewel was right up my alley, so it's no surprise that I absolutely loved everything about it. Its island location makes it feel like a special escape, even one that can happen on a weeknight. 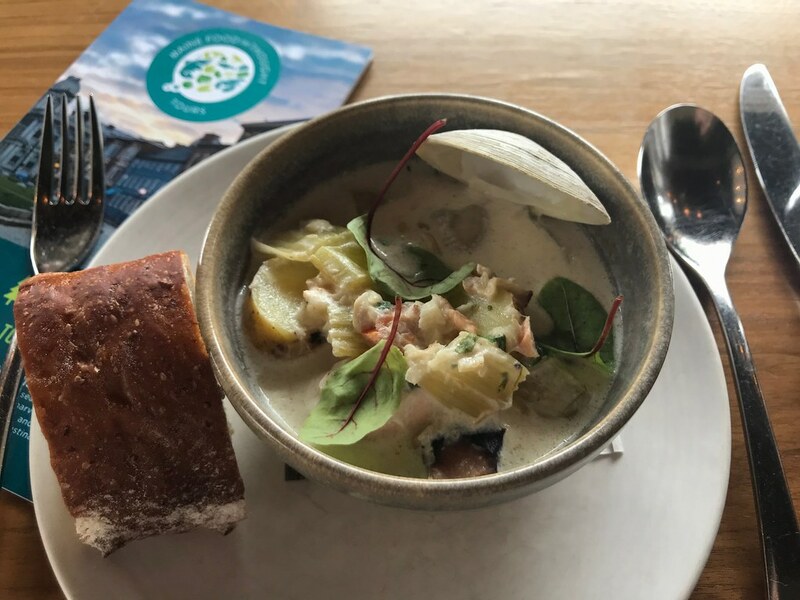 Don't let the location or the weather stop you from enjoying one of Portland's most unique dining experiences. Crown Jewel is open daily, except Tuesdays, for lunch and dinner until Columbus Day. 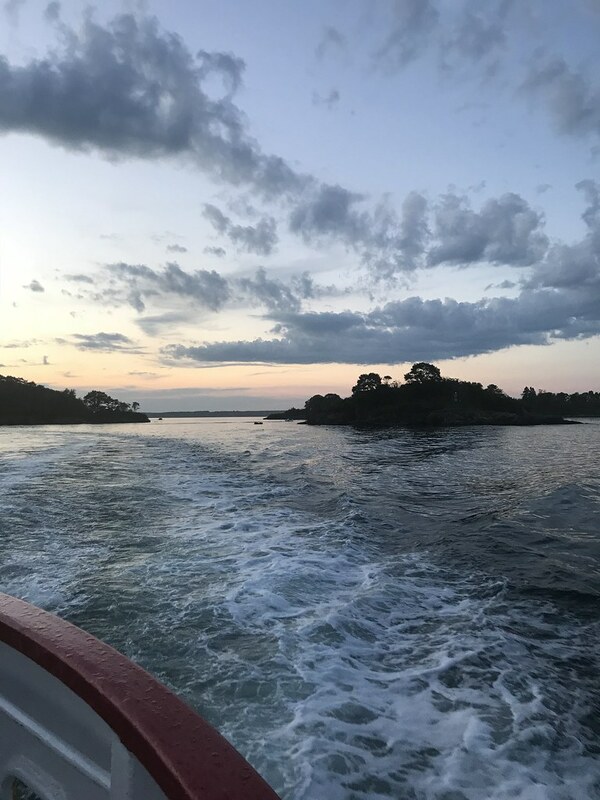 My husband and I celebrated our one year wedding anniversary out on Chebeague Island this year with a stay at the Chebeague Island Inn. We were married on Peaks Island, so it seemed appropriate to spend the night on another island in Casco Bay a year later, fortunately with the same gorgeous weather we had on our wedding day. And while the meal and the stay were lovely, honestly, my favorite part was cozying up during a brief thundershower in the inn's living room with a book and a cocktail. 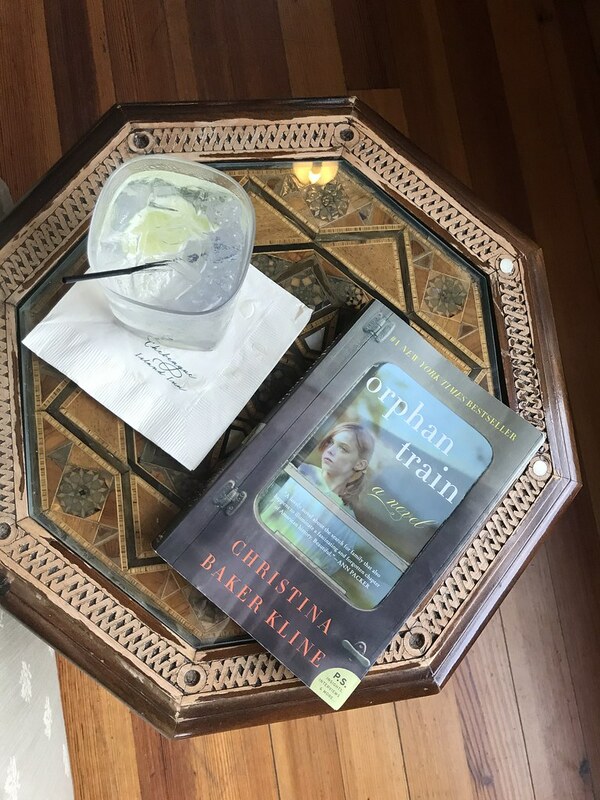 I enjoyed a Hardshore gin and tonic with Orphan Train, in an overstuffed armchair, and felt like I'd died and gone to heaven. Fortunately for you, the public is also welcome to order drinks from the bar and enjoy them on the covered, wrap-around porch of the inn. When it came time for dinner, I reluctantly tore myself away from my cozy chair and took my spot at a table on the screened-in porch. Since I last ate at the inn in 2015, the Prentice Group has taken over, meaning Chef Matt Ginn of EVO oversees the kitchen now. I was looking forward to the traditional menu of the inn now updated with some modern touches. We started our meal off with some housemade biscuits and a bowl of steamed Bangs Island mussels ($17). 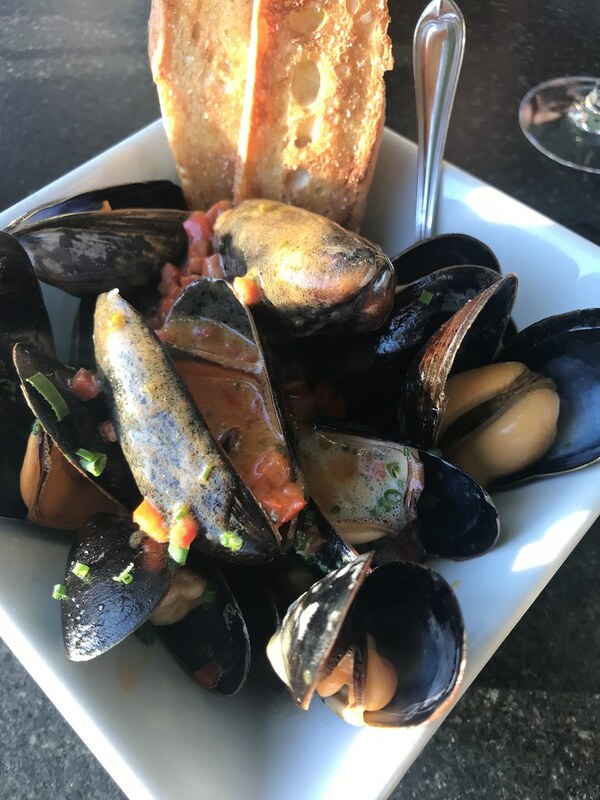 The mussels were big and in a bowl of spicy, garlicky broth with bits of chorizo. 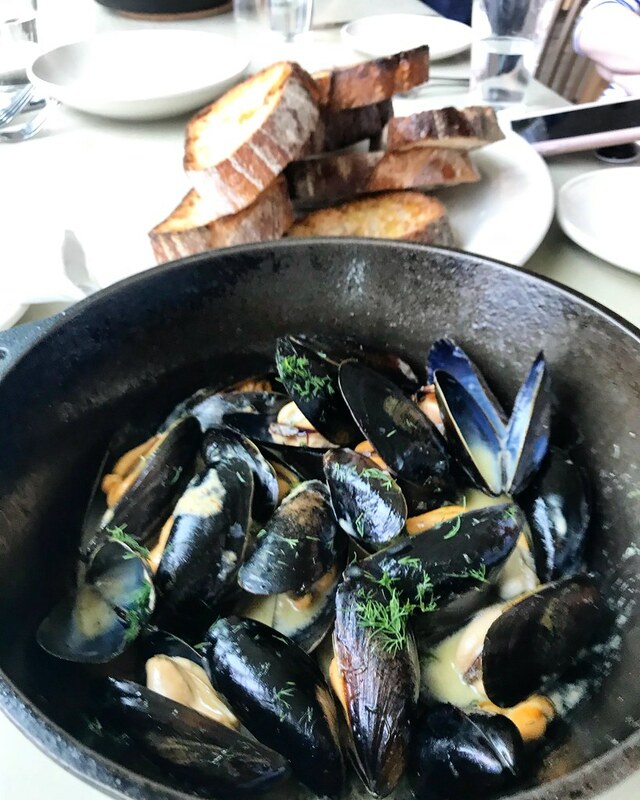 The last time I'd had the mussels here, they were smoked and not served in a broth, so we loved the change to the more classic preparation. 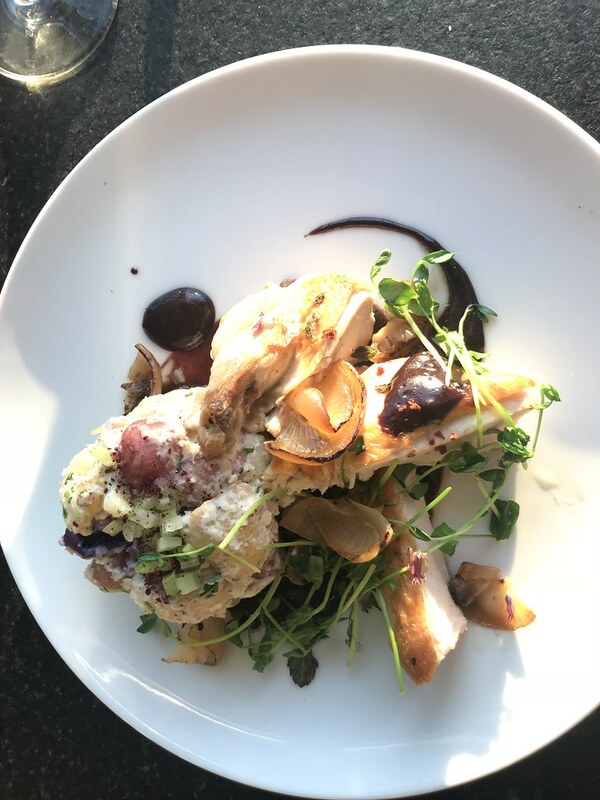 A. ordered the pan-seared chicken breast with potato salad, cippolini onions, and a blueberry glaze ($27). I had a small bite and found the chicken was perfectly cooked, with a nice sweetness from the blueberry sauce. The sauce erred on the side of savory, which I appreciated. The squash rollatini with hazelnut, grain salad, and burrata ($28) called to me, but I went with the scallops, served with pistachio, shishito peppers, and cucumber. 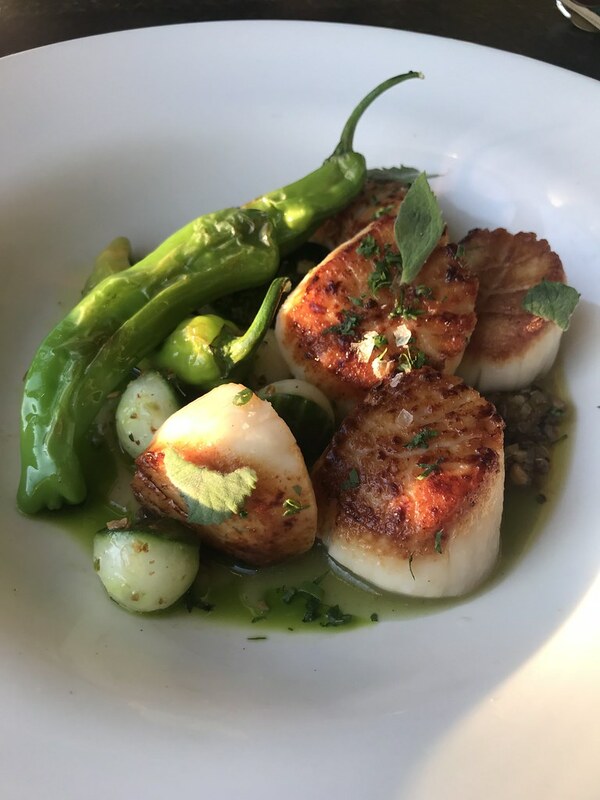 The scallops were seared just right—crispy on the outside and rare inside. But the dish never came together in a coherent way. The peppers, cucumber, and hazelnut sauce all seemed like separate ingredients that didn't really go together. I really enjoyed the shape of the little scoops of cucumber though. Our meal with two glasses of wine came to $108 before tip. Since we were staying at the inn, we signed the meal to our room and decided to take the inn's bikes to the Slow Bell Café for ice cream. Just like anytime on the island, it felt like we'd escaped on vacation in this idyllic place. 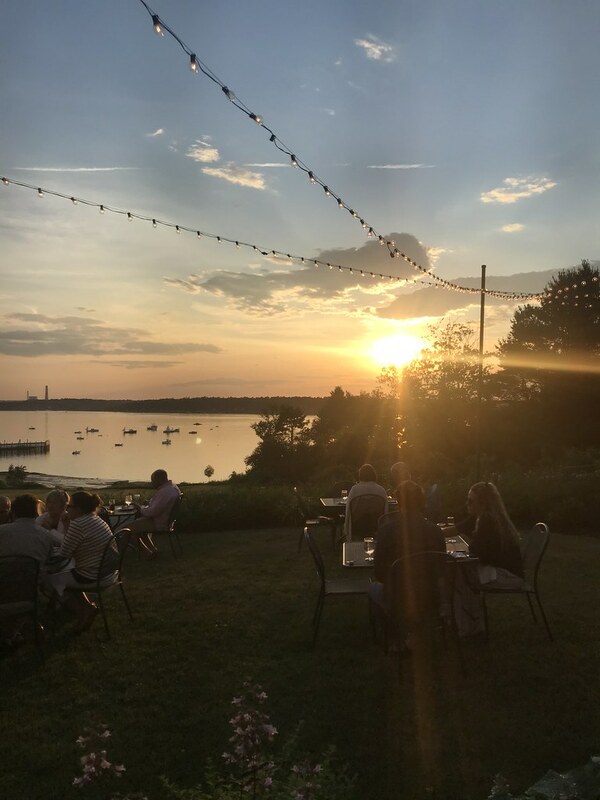 The Chebeague Island Inn is accessible by the Casco Bay Lines from Portland. There is no car ferry, so call to arrange a ride from the ferry dock to the inn (about 3 miles). Otherwise, drive to Yarmouth to take the Chebeague Transportation Company's ferry and you can walk to the inn from the ferry dock. 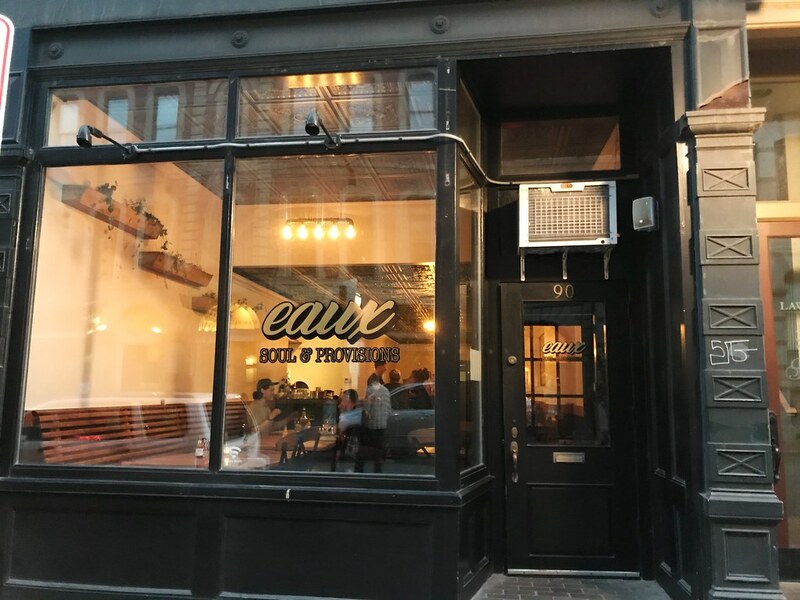 Former food cart Eaux opened its brick and mortar last night, and I was particularly excited about this move. I'd always wanted to try the Cajun-themed cart, but never managed to catch it (I guess my days of hanging for hours at breweries have waned). So I walked down to the Old Port last night, a particularly nice night, to have dinner at Eaux, now operating in the former home of Crooners and Cocktails on upper Exchange Street. 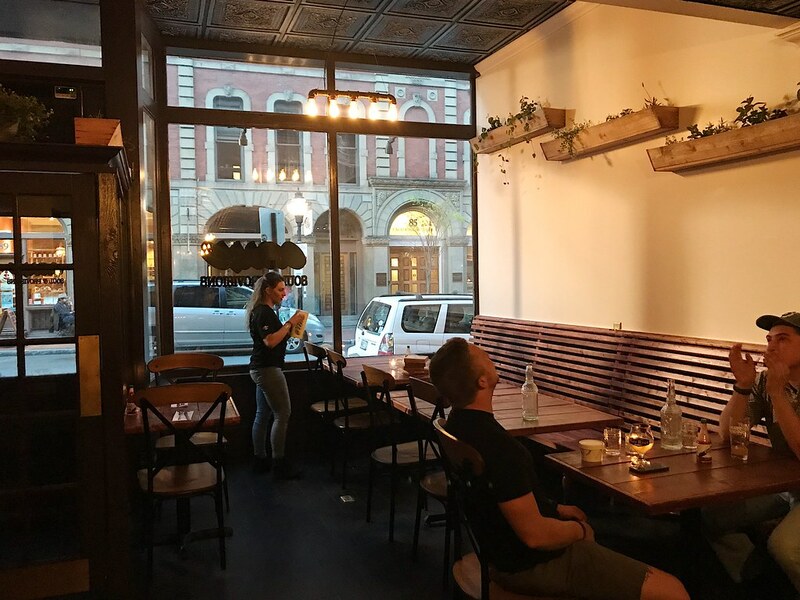 Eaux's decor is pretty minimalist, something I figure they'll embellish as they go, but the space is nice with big windows and a pressed tin ceiling. The tables in the back get a little dark, but it could be seen as cozy. There's no host stand, but we were greeted immediately by a waitress, one of two, who ended up being our server. We sat ourselves at a two top and she dropped menus quickly. 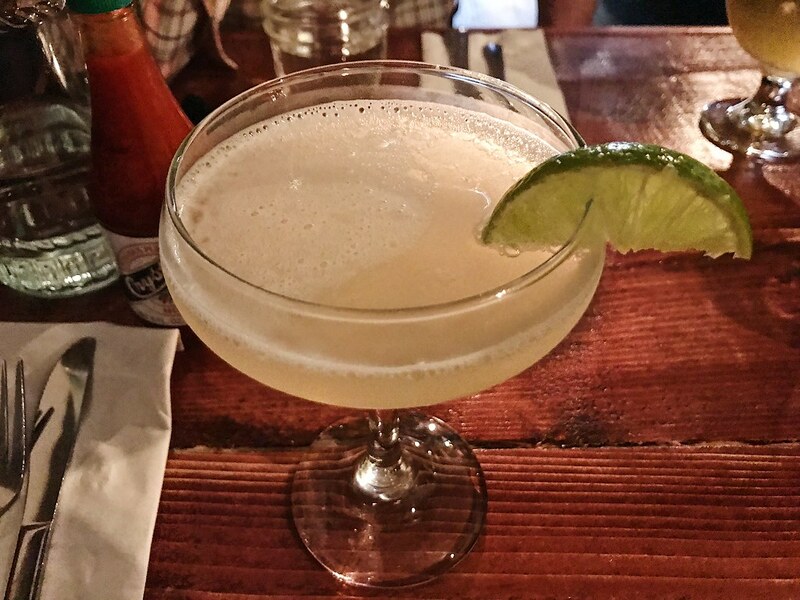 I ordered a daiquiri from the cocktail list—filled with New Orleans classics like Sazerac and Hurricane. A. ordered a Goodfire draft beer from a list exclusively filled with local beers, representing the breweries that hosted the food cart, from Industrial Way to the East Bayside breweries. The food menu offers 6 starters and 6 entrees, and I knew from social media posts that I was having the chicken and waffles. So I ordered a few plates of vegetable snacks to round out the meal. 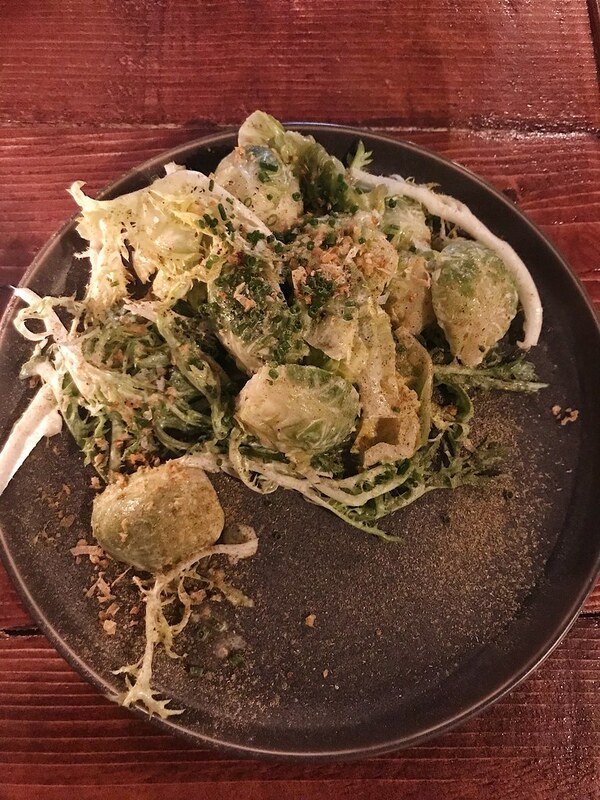 I didn't know what to expect with the chilled Brussels sprouts ($8), a salad of halved Brussels, mustard greens, cider vinegar, and sassafras. At first I thought it was strange, but then found it oddly compelling. It was tangy, creamy, and crunchy... but you've got to like Brussel sprouts to enjoy them in this preparation versus the oh-so-popular fried version. The crispy yams ($6) also impressed, indeed crispy and chewy, served with a sweet roasted onion puree and a horseradish cream sauce. Boiled peanuts, a farro salad with shrimp and rhubarb, and fried butter beans are other snacks well representing the Southern genre. After a pleasant break—not too short, just long enough for me to wonder if there was starting to be an issue—our entrees arrived (I don't think there was an issue, I think we've all just become accustomed to having all our food arriving all at once.) A. enjoyed his gumbo with shrimp and hake, spicy and served over rice. 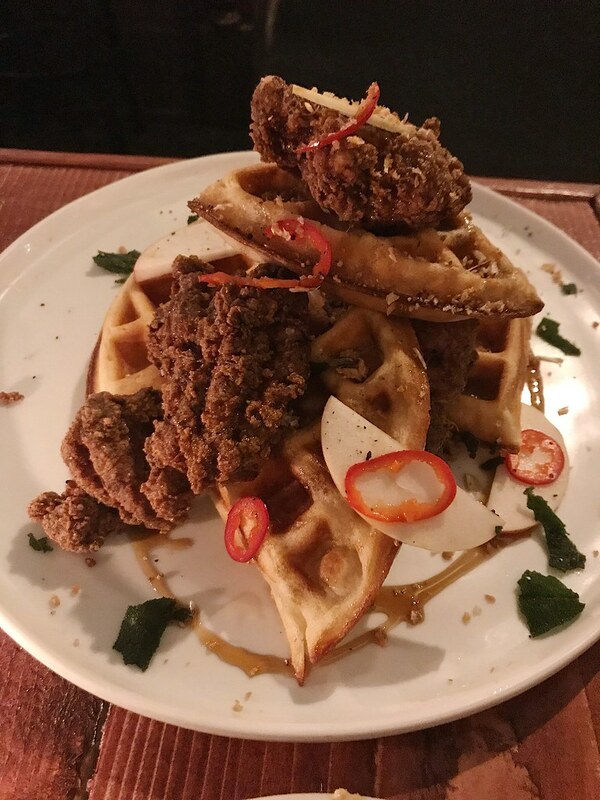 I loved my chicken and waffles ($14), with spicy pickled peppers, apple slices, and fried sage leaves. The most striking part was how much flavor the fried chicken had—the breading was pleasantly salty and the chicken was very tender. Eaux is a welcome addition to Old Port dining options, and I'm impressed how easily the chef and staff transitioned from a one-man outdoor show to running a full restaurant. 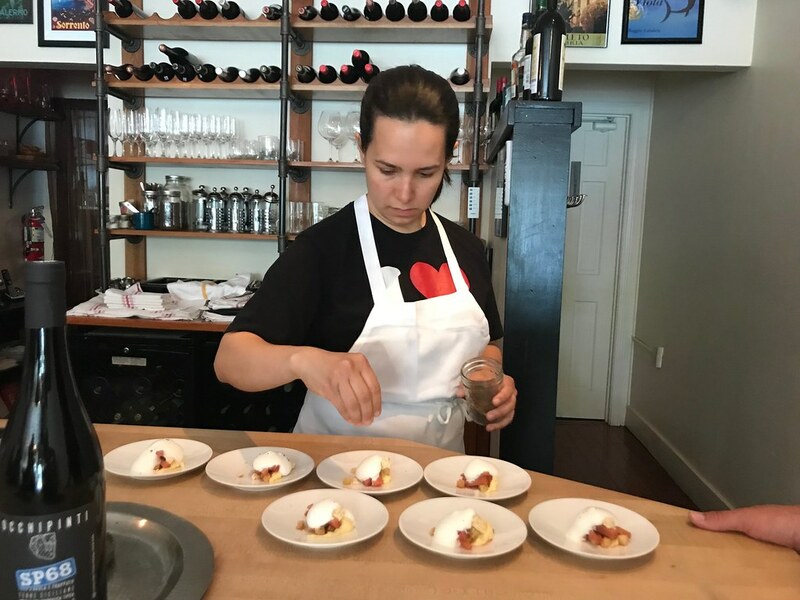 Stop into Eaux for a taste of the South, bringing something different to Portland. It's been quiet around these parts—I haven't been eating out much and haven't even had a recent restaurant opening to bring you! But there's still a few tidbits to share, so here's what I've been up to lately in food. I always think of Mami on Fore Street as a lunch spot. Maybe it's due to its origins as a food truck, but since I don't work in Portland, I don't go out to for lunch often. But when I was passing through town after a program, I stopped in and grabbed A. from East End Cupcakes and we checked Mami out. 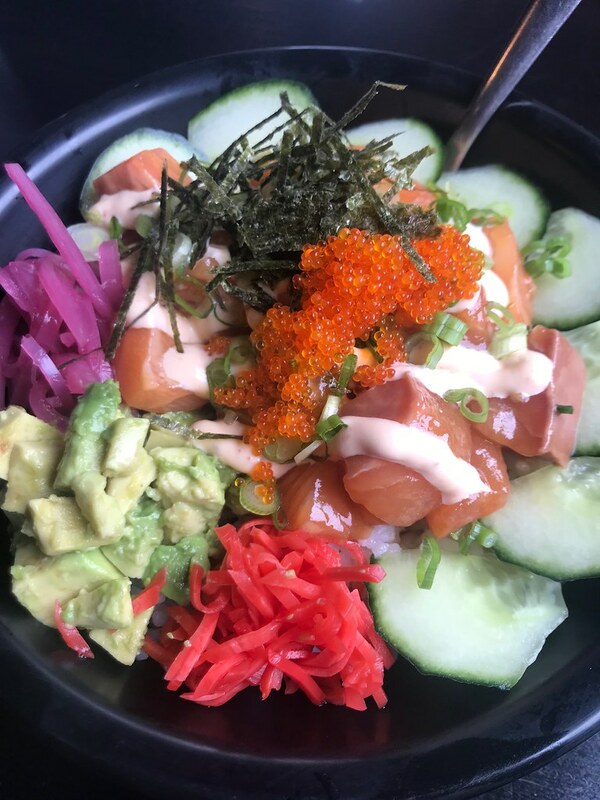 She had a salmon poké bowl ($13) (but Big Fin Poké still has our hearts) and I had pork buns ($5) and okonomiyake ($12). 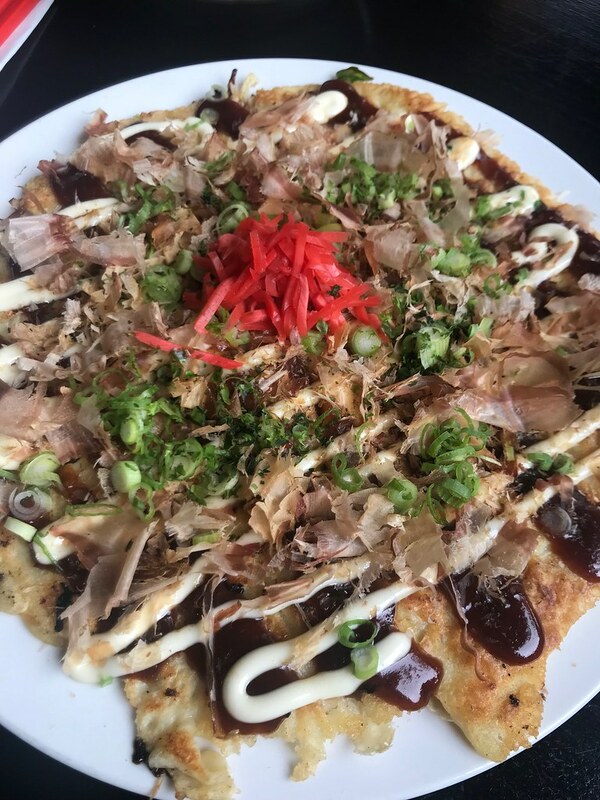 Both dishes were rich and contained mayonnaise—I should have skipped the savory pancake and ordered some shishito peppers. But I loved Mami's counter service, making it a quick option for lunch or a great happy hour where you won't have to wait for a beer refill. Original Roomie A. and I went to the farmers' market bright and early on a Saturday for some plants, then found ourselves considering "brunch" (meaning we wanted a sit-down experience) options at the decidedly non-brunch hour of 9am. We thought of Local 188 and it was a stroke of genius. We had the place to ourselves, our bartender was so friendly and attentive, and the food came out quickly and was perfect. 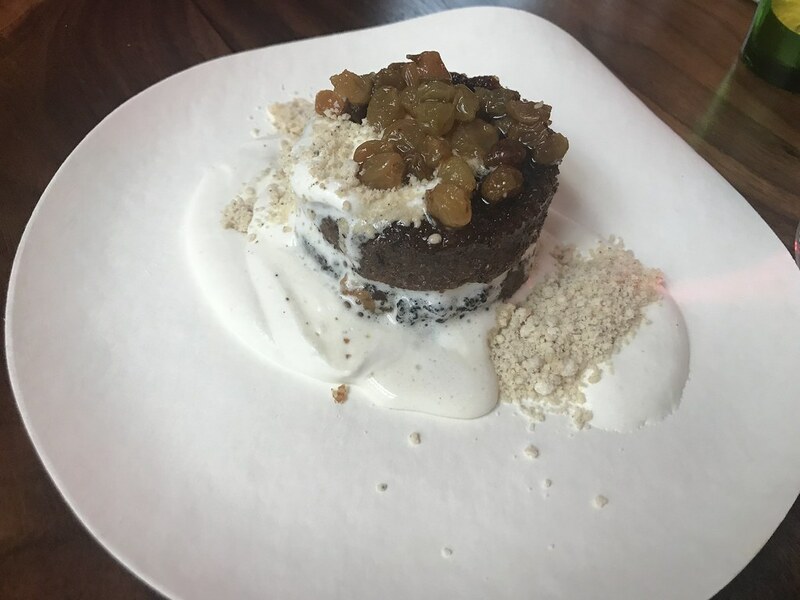 I've experienced some lackluster brunches at Local, probably due to the fact that they were slammed, and so going early was a fantastic experience. 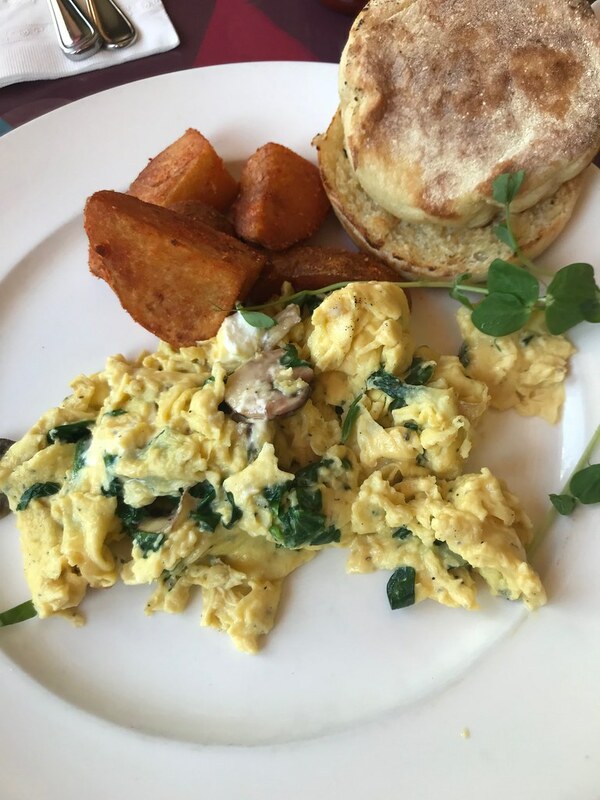 A. and I both had the scramble ($11), which that day was with mushrooms, herbs, and goat cheese. 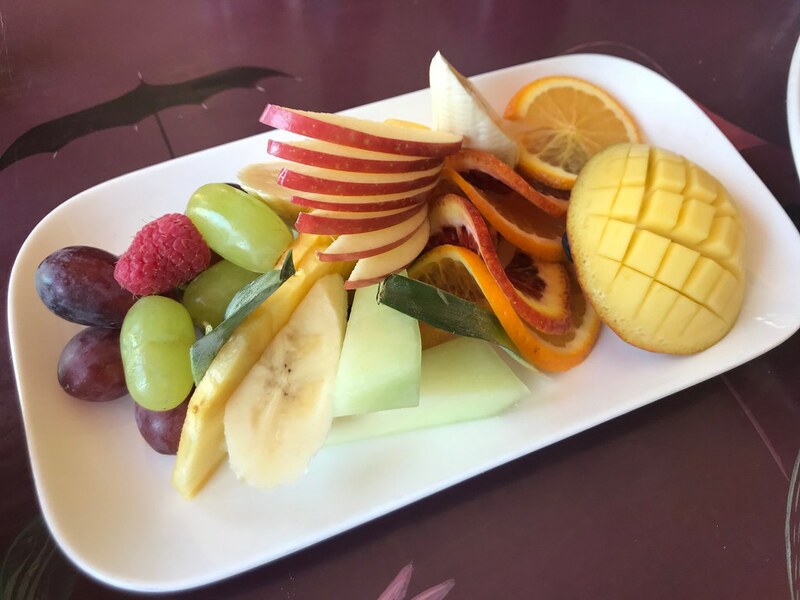 We shared a fruit plate ($6), and I really felt like I'd reached peak adulting. 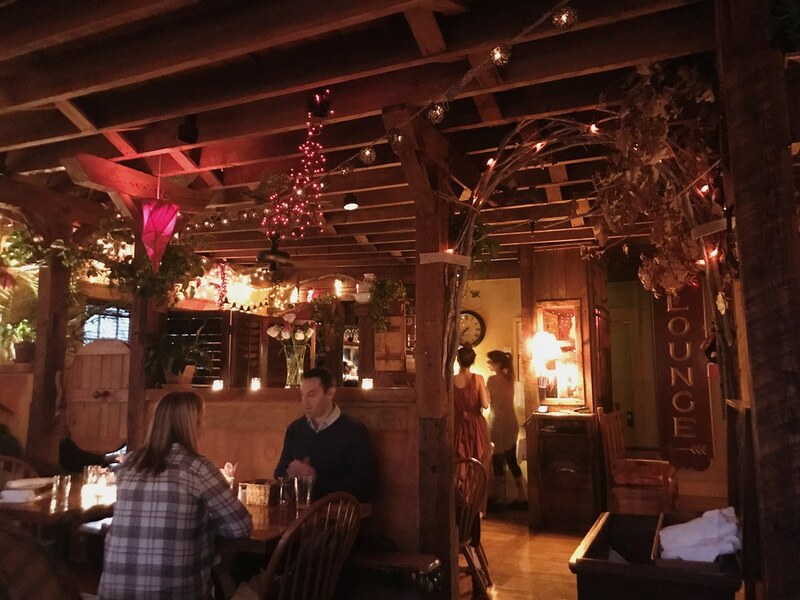 For a dinner out with friends to celebrate their engagement, we went to The Treehouse, formerly Pat's Café, on Stevens Ave. I'd never been before, so I don't know the history of the place... but they certainly ran with the treehouse motif! It's on the second floor of Pat's Meat Market and is decorated with fairy lights, flowers, and I guess tree branches. It's partitioned off into cozy little spaces and I loved it. I look forward to going back to sit on the outdoor deck in the treetops. The menu featured a lot of repeating elements, like phyllo dough and dishes served "over fettuccine." I had the gulf shrimp saffron sauté ($30) with mussels, bacon, red peppers, tomatoes, shallots, and a saffron cream sauce. There was also half a zucchini—surprise! It was a good meal at a cozy spot, but its prices mean I'll probably stick to drinks and apps when I visit again. 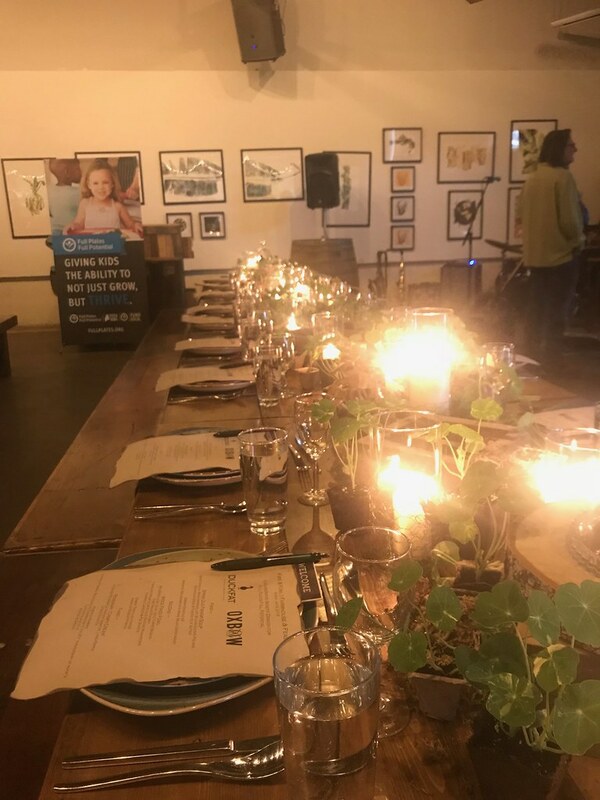 Finally, I attended a Full Plates, Full Potential benefit dinner at Oxbow, where Rob Evans of Duckfat and his crew cooked. The Duckfat/Oxbow beergarden is nearly ready which allows Evans to cater special events at Oxbow like this one. 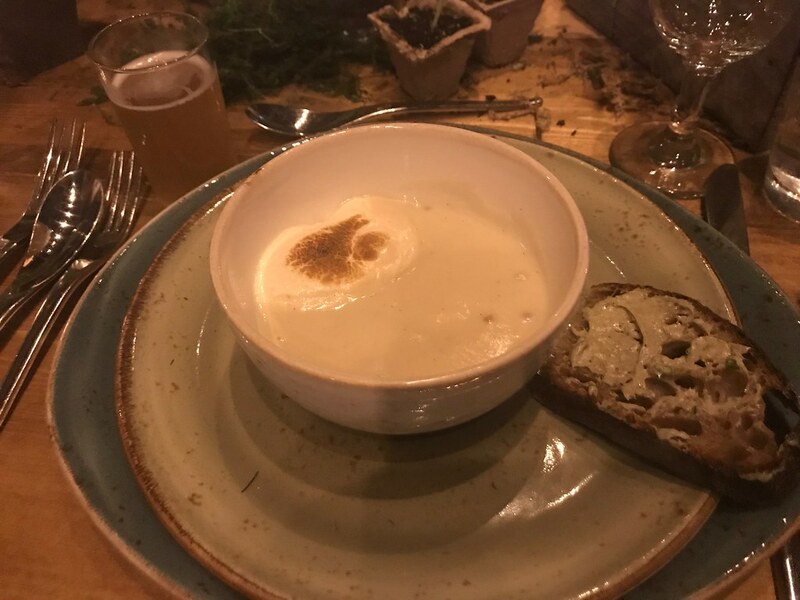 We enjoyed a three course spring-themed dinner, from scrambled duck eggs eaten out of the shell to a spring-dug parsnip soup topped with burnt marshmallow. 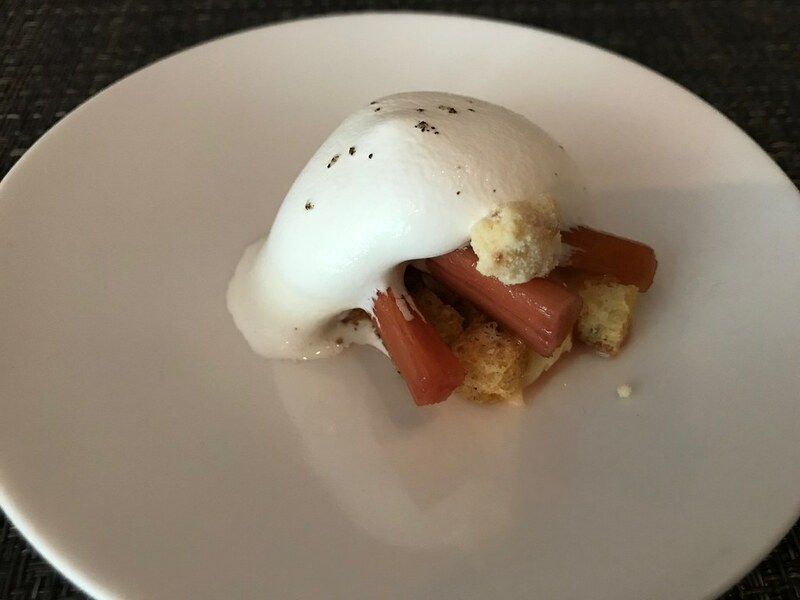 The entree was a collection of poultry, from duck meatballs to turkey boudin, prepared on the grill, served with farrow and roasted carrots, and dessert was a sabayon with poached rhubarb and citrus olive oil. Your next chance to enjoy a Rob Evans prepared feast is June 21st with a VIP night at Oxbow before the Lettuce benefit concert. And we are due for a flurry of summer openings, so stay tuned for some previews! This article was originally published in Lark Hotels' magazine in May 2018. 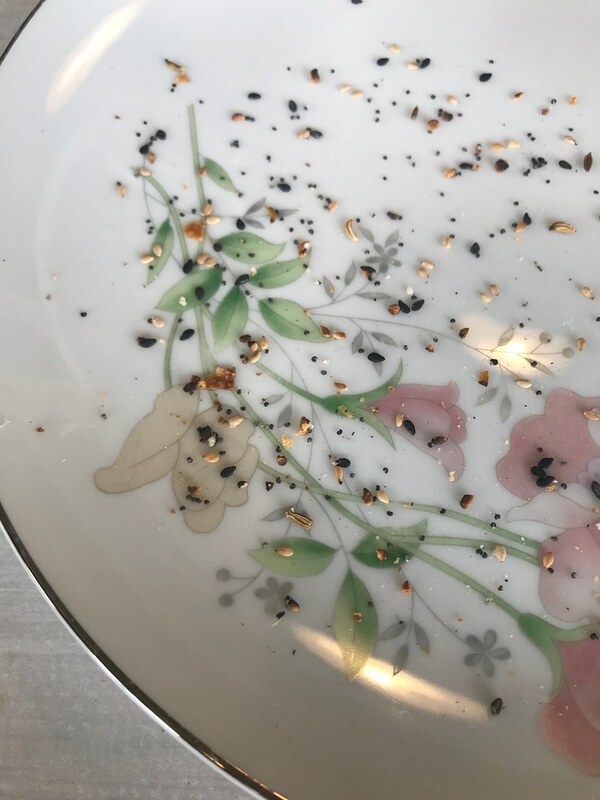 Today’s diners looking for a restaurant recommendation in a new city often want—and even expect—a novel experience, a quirky environment, or something that makes them feel clued in to the next big thing—and sometimes all three at once. Many of Lark’s destinations deliver just that. 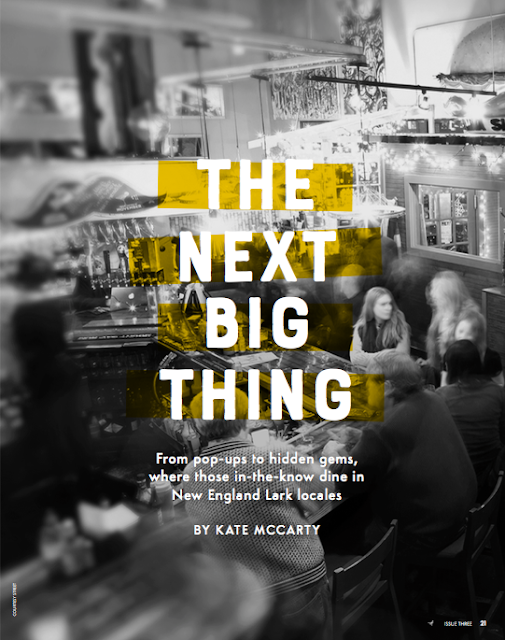 Salem, Massachusetts, is known for its pop-ups and their offshoots. 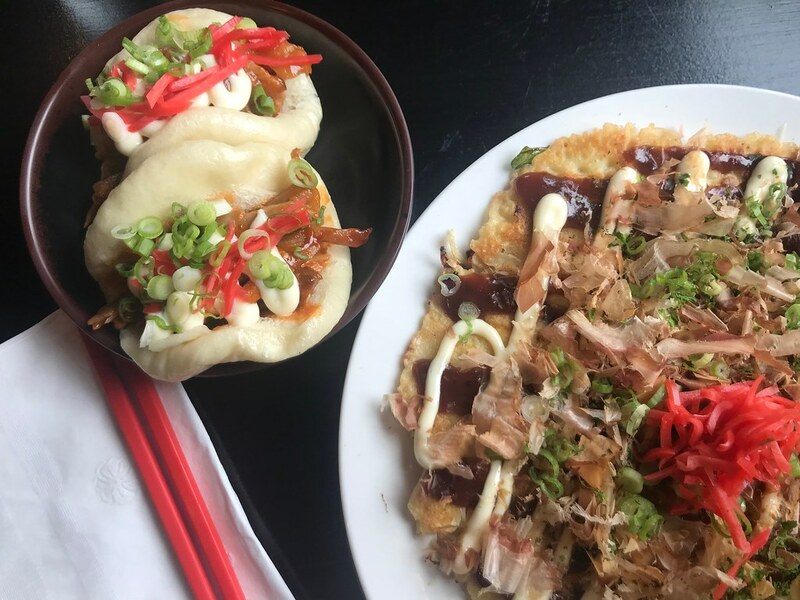 On the savory side, for example, we just can’t resist the open secret that is Back Alley Bacon with its pork-centric street food (look on Facebook for its Wednesday night menu). Feel the need for sweets instead? On weekend nights, get directions to Goodnight Fatty and snack on what some consider the best type of cookies around—ones with crispy edges and gooey centers fresh from the oven—aka “fatties.” Owners Erik and Jennifer Sayce say the idea for their business was born out of their own craving for warm cookies on their walk home from dinner one night. Flavors change each week and range from fruity to decadent, with the signature flavor Midnight Fatty, a chocolate cookie with chocolate chips, pecans, and toffee bits, always a bestseller. And naturally, a bottomless glass of milk is available. Goodnight Fatty began popping up in coffee shops and breweries in 2016, while Erik and Jennifer got a feel for consumer demand and searched for retail space. In 2017, they found their own space. 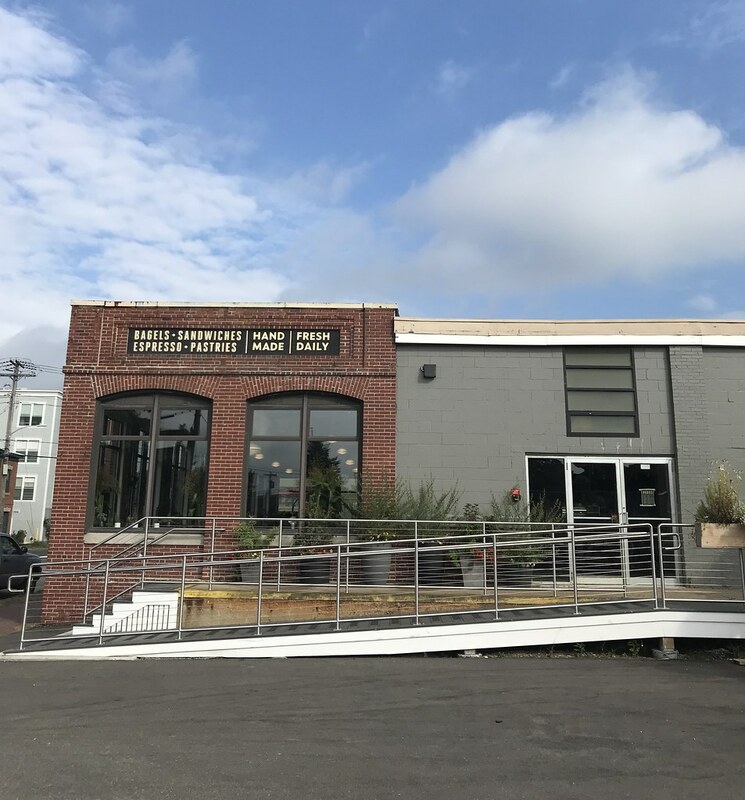 The unexpected and somewhat hard-to-find location—an unassuming conference room rented from a media company in a building down an alley behind Rockafellas and Ledge restaurants— maintains the in-the-know pop-up vibe. Customers love pop-ups partly because of that feeling of being in on a secret, according to Jennifer. “They also know that they are supporting a fledgling business and getting a unique experience,” she adds. 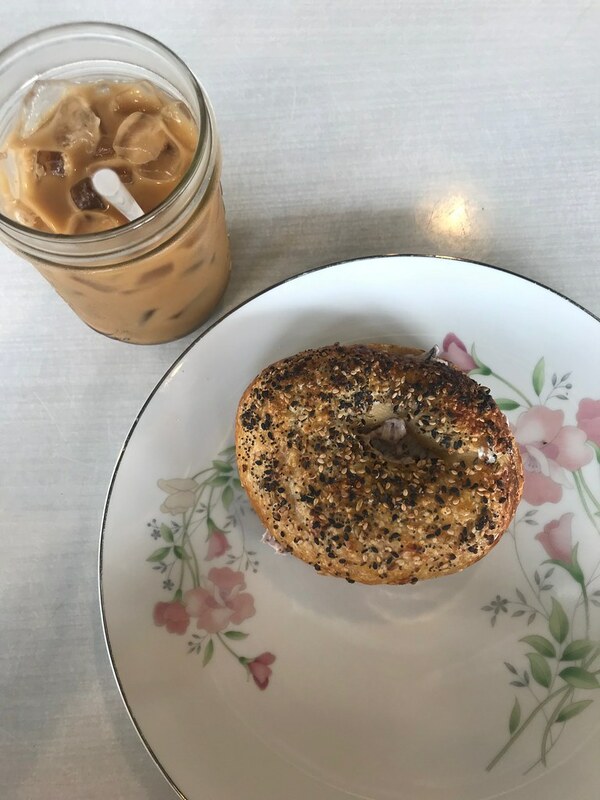 Another popular pop-up, Rover Bagel outgrew borrowed spaces in Salem as well and found a permanent home in Biddeford, Maine. The bakery is known for its crackly Montreal-style bagels, which are baked in wood-fired ovens. Before moving, the owners had used Bambolina’s ovens in the mornings when the restaurant wasn’t open. What will the next pop-up sensation be? 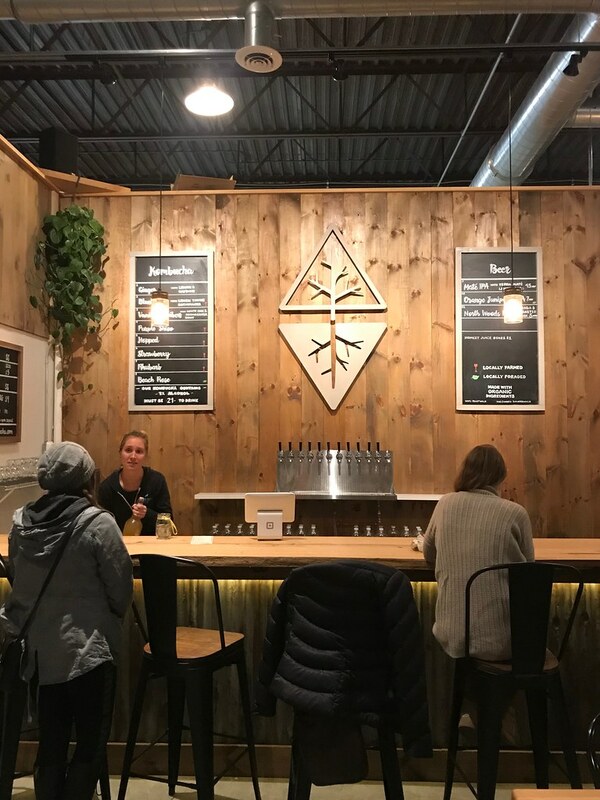 Check in at Notch Brewery, the Far From The Tree Cider tasting room, and Deacon Giles Distillery, which often host new pop-ups, and you might be one of the first to discover it. 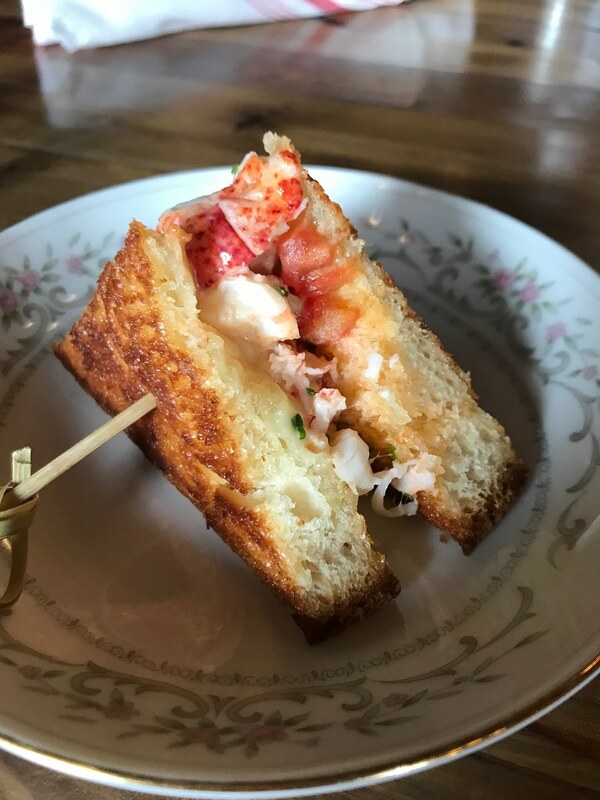 To find this hidden gem, don’t worry when your GPS guides you to the back of a nondescript strip mall in Portsmouth, New Hampshire. Inside, owners Joshua and his wife, Michelle Lozuaway, who handles the front of the house, have transformed the space into a cozy bar and restaurant with spray-painted graffiti and colorful murals. With crispy, sticky sweet Korean fried chicken, lacquered Thai ribs, spicy pork dumplings, and a cast-iron skillet of crispy rice bibimbap, Street nails these popular Asian street food dishes. Empanadas, tacos, and yucca fries represent the Southern hemisphere, with the cemita—an overstuffed Mexican sandwich with a slab of fried cheese and your choice of a fried chicken thigh or a veggie burger—frequently stealing the show. On the inventive cocktails menu, the Unbeetable is a customer favorite: beet infused vodka with muddled cucumber and mint, chili simple syrup, and lemon, topped with ginger beer. 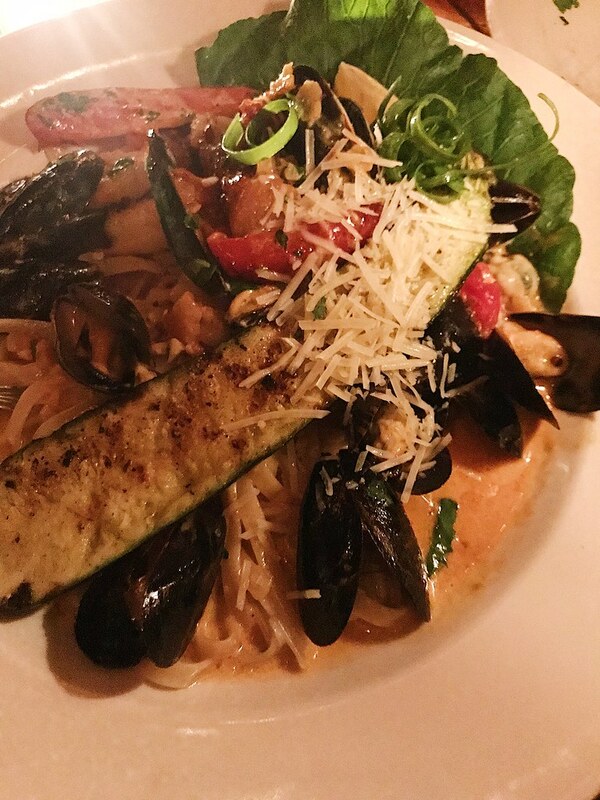 In short, the perfect combination of earthy and spicy. And don’t skip dessert—the Italian zeppole are expertly fried, dusted with powdered sugar, and served in a brown paper bag. Metzy’s Taqueria—the first food truck in Newburyport, Massachusetts—was an instant hit when the truck parked near the beach on Plum Island in 2014. (The route is expanding to include the nearby beaches of Salisbury and Amesbury.) 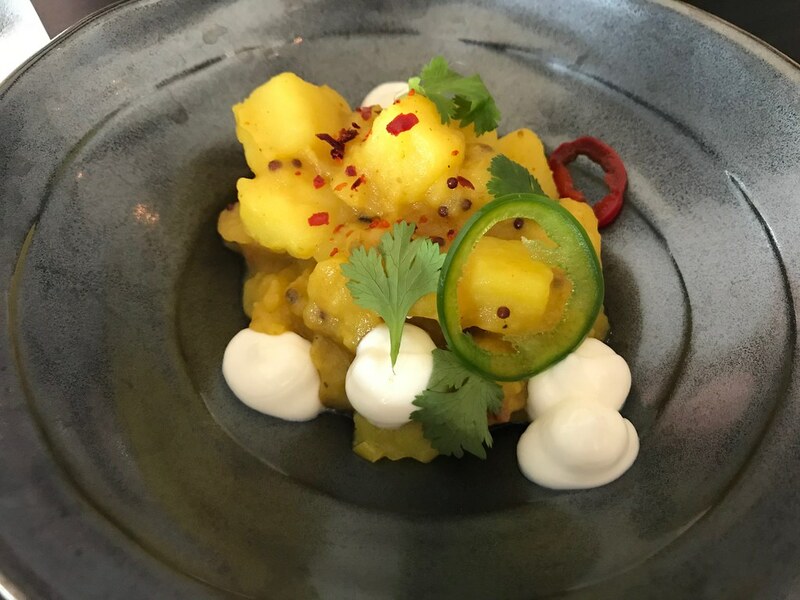 Owner Erik Metzdorf quickly realized he needed to expand his commissary kitchen space to handle the demand for Chef Brad DeLibero’s take on Mexican street food. The cantina’s ample kitchen space allows the restaurant to augment tacos and burritos with soups, salads, and daily specials. 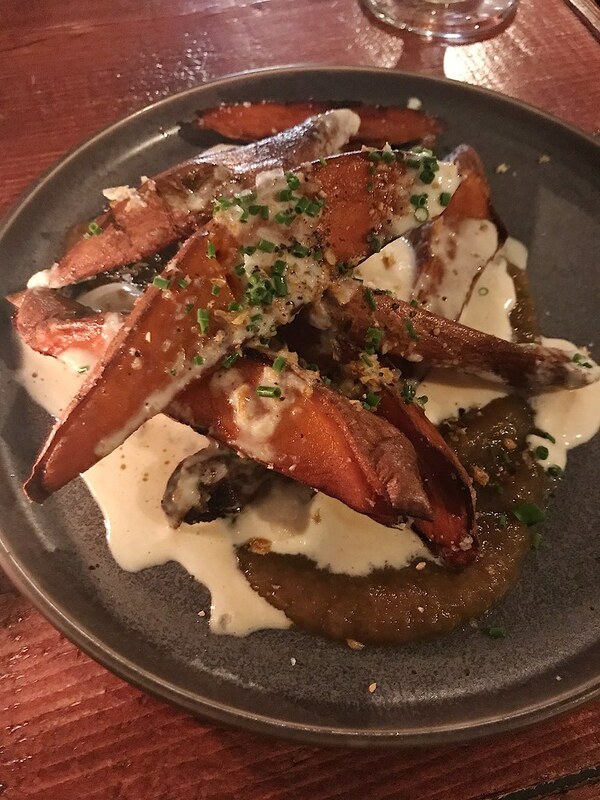 Start with sweet potato and black bean hush puppies served with chipotle sour cream or the slow-cooked pork belly ribs finished with maple bourbon sauce and served with sweet potato fries. Wash down a pork belly taco, lined with shredded cabbage and piled high with crispy cubes of fried meat and a mango habanero salsa, with Melt Away Session IPA from Newburyport Brewing Co.
Everyone who visits Kennebunk, Maine, expects two things: lobster and a good view of the ocean. 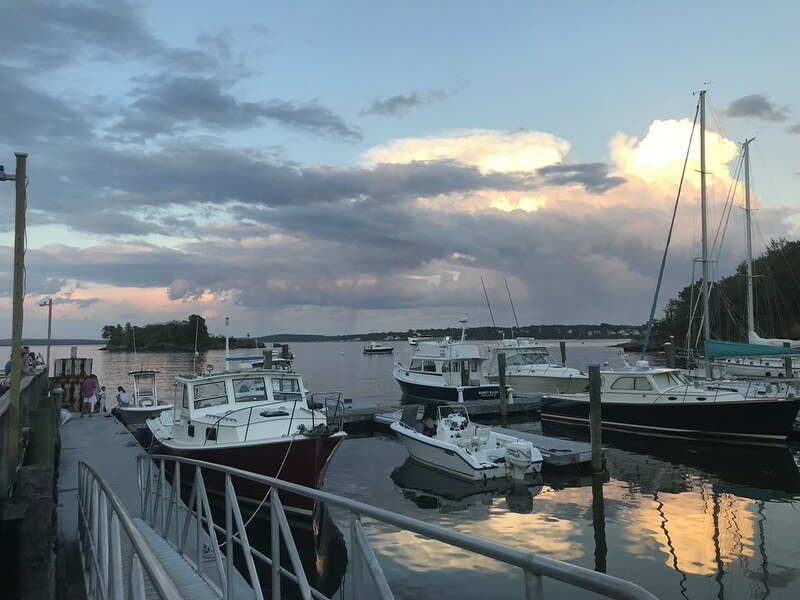 While many restaurants serve up both, one in particular takes waterfront dining to the next level—The Spirit of Massachusetts Restaurant, a historical schooner turned floating restaurant. 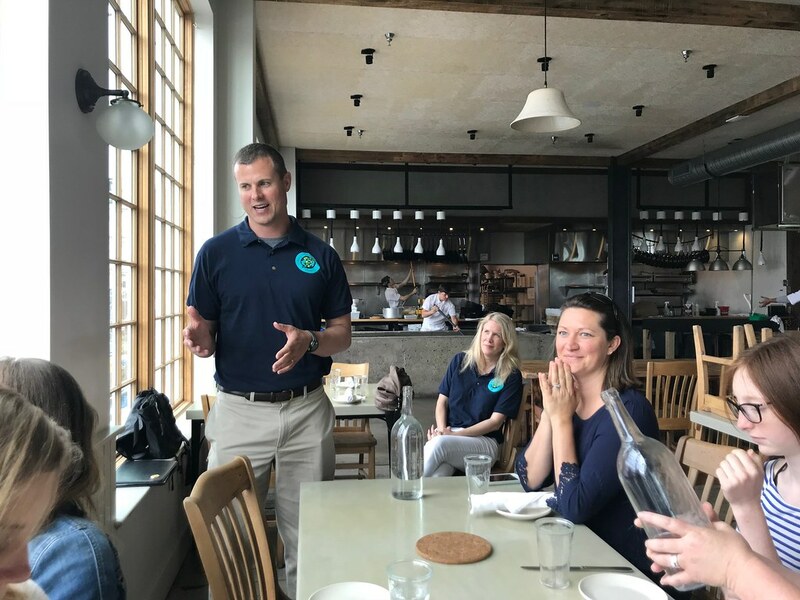 Once an educational nonprofit’s training vessel, The Spirit of Massachusetts languished in Portland, Maine for a few years until it was discovered by Dwight Raymond, the owner of The Pilot House, a local favorite in Kennebunk’s Lower Village. Dwight acquired the dilapidated schooner and worked with his son, Nick, to retro t it into a restaurant, which took about a year and a half. Docked behind The Pilot House and next to First Chance Whale Watch, The Spirit opened in the summer of 2016. Its tall masts rise above all others, a beacon for thirsty sailors and hungry travelers alike. You enter the restaurant via the metal gangway, sometimes a steep descent when the tide is low. The boat’s masts, booms, and rigging are all still in place but now support a tent that provides shade. Sloped to follow the curve of the boat’s deck, a polished wood bar runs the length of the deck. Descend a wooden staircase to the main cabin, which serves as the dining room. Choose from cushioned banquette or wooden bench seating around tables that are bolted to the floor. The aft cabin is a fully functional kitchen, with steamed lobsters passed up through the hatch when an order’s up. The Spirit’s menu is primarily seafood, with a raw bar selection of local oysters and clams on the half shell, shrimp cocktail, and chilled lobster tails. Some diners go casual with a pound of peel and eat shrimp, liberally dusted with Old Bay, and slices of Andouille sausage. Others channel Kennebunk chic with ahi tuna poke and seaweed salad.